One of the best parts of a job as a Product Manager or Technical Specialist is the continual learning that comes from customer interactions, relationships and collaborations. Visiting a new lab, learning about new areas of research and helping to guide measurements with real meaning and consequences is both enjoyable and rewarding. This is particularly true when starting a new academic collaboration. 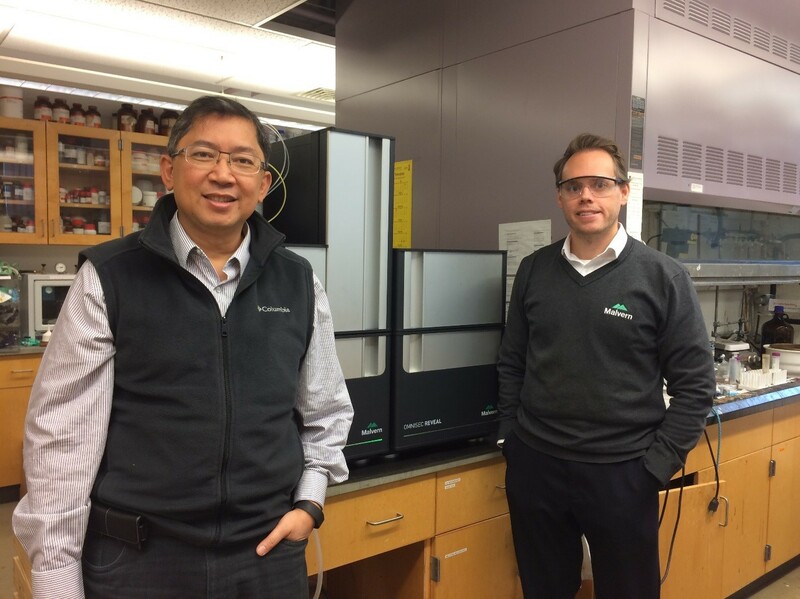 At Malvern, we’re pleased to announce that we are starting a new collaborative partnership with Professor Rigoberto Advincula at Case Western Reserve University (CWRU) to use advanced multi-detector gel-permeation chromatography (GPC) techniques to study novel polymer conformations. I recently visited Prof. Advincula and his group at CWRU to install an OMNISEC GPC system and train his students in its use. OMNISEC is a complete integrated multi-detector Gel Permeation Chromatography (GPC) system comprising two units. OMNISEC RESOLVE includes the degasser, pump, autosampler, and column oven, so takes care of the chromatography. OMNISEC REVEAL includes refractive index, UV-Vis, light scattering, and viscometer detectors to offer complete characterization of polymers as they elute from the column. This gives sample concentration, molecular weight, size, and structural information, all without column calibration and in a single measurement. The synthesis of polymers in unique conformations such as coiled and uncoiled knots. Branched polymers synthesized on the surface of nanoparticles, investigating whether steric interference affects the synthesis compared with free polymerization in solution. The synthesis of polymers under flow conditions to investigate if this can better control the final polymer molecular weight and polydispersity. As we set out on this new collaboration together, it’s exciting to get together and consider how multi-detector GPC could be used to characterize these samples. For example, not only will it be able to measure the absolute molecular weight of these types of novel polymers, but it should also be able to discriminate the changes in structure that come from conformational changes and the possible change in branching levels caused by steric interference in polymer synthesis. I’m very much looking forward to seeing how these experiments work out and learning more about this exciting polymer development research and as we generate data together, we’ll be sure to bring it to you and show you how this technique can strongly support this kind of high level polymer research. Prof. Rigoberto Advincula (left) and Dr. Mark Pothecary with the newly installed OMNISEC system.